Veteran hockey writer Andrew Podnieks has teamed up with up-and-rising Rob Del Mundo (of TMLFans.ca fame) to give us the new book "The Best, Worst, and Biggest NHL Trades of All Time." At $12.99 this 240 page book is going to be a hit. Buy The Book - The book is available exclusively at Chapters/Indigos stores in Canada and websites. Shipping is available throughout Canada and the United States. What a great trip down memory lane. For me, and many fans of my generation, the trades that rocked my world the most were the Gretzky to LA and Lindros to Philadelphia trades. To the authors credit, they didn't get too crazy re-hashing these two trades. Yes, they are among the most important moments in the history of the game, but their coverage has been largely exhausted. The authors don't allow any trades to dominate the book. 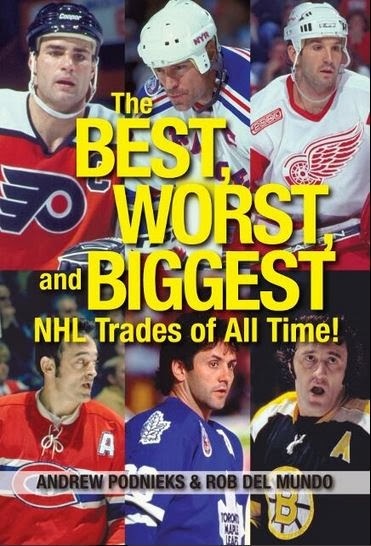 While the Gretzky and Lindros trades jump to mind immediately, the authors certainly do not forget about Brett Hull or Doug Gilmour leaving Calgary, Rod Langway going to Washington, Boston fleecing Vancouver with Cam Neely or Patrick Roy's hasty exit from Montreal. Though the book is heavy on trades in the 1990s, and with proper merit, the authors do an excellent job digging through history. The trades of King Clancy, Howie Morenz, Teeder Kennedy, Ted Lindsay, Phil Esposito (twice) and Lanny McDonald, amongst others, shaped hockey history. While the authors do not allow any one trade to dominate the entire book, perhaps the authors do not dig deeply enough in some cases. I was hoping to learn what really prompted Boston and Montreal's swap of unknown prospects to land 16 year old Ken Dryden. Or what the real story was behind New York Islanders fans discontent towards Kirk Muller. The did do an excellent job digging, for example, to explain why Eddie Shore left Boston, so it is there, just not consistently. This book is sure to be a hit. It is a perfect Christmas gift idea for the hockey fan on your shopping list. It is well priced and nicely produced, and is sure to bring back memories and renew a few debates. The book is available exclusively at Chapters/Indigos stores in Canada and websites. Shipping is available throughout Canada and the United States.